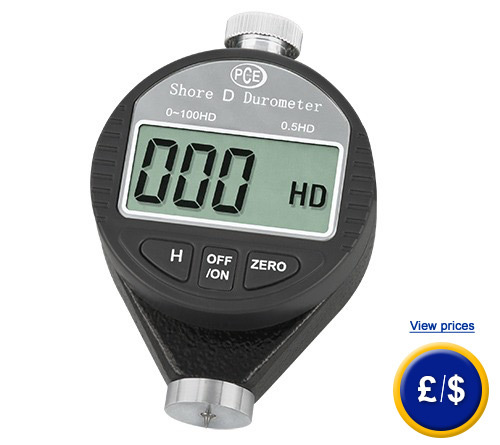 The PCE-DD D durometer is a compact device for checking the hardness of Shore D which is provided and used for harder materials, such as hard rubber and thermoplastic. The PCE-DD D durometer uses a 30º cone with a pressure force of 50 Newton as an indenter. 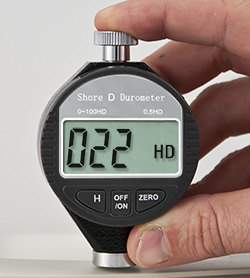 Measurement tests of the durometer should have a minimum thickness of 6 mm. If the material thickness to be measured by the durometer is not enough, it should be reinforced on the back with the same material in order to increase its thickness. 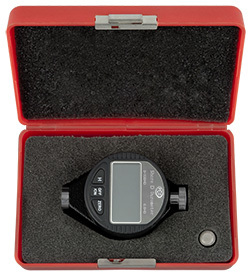 At this link you can find an overview of any type of durometer that you may need. Information about measuring methods can be found at the following link. Classification of different degrees of hardness can be found here. The type-D test control shows if the durometer will operate within a specified tolerance. These tests are used in production as well as research and development. In the box you will find seven tests. The tests are identified by a series of numbers to ensure that they are not misidentified. 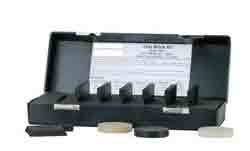 The range of hardness of type-D is 30 to 90. The tests serve as a reference check showing the optimal state of the durometer operation. The durometer must never be recalibrated during the control tests.